One of the best things about working at Fine Cooking magazine all those years was the wealth of great tips I gleaned from the chefs, cookbook authors and other amazing cooks we worked with to produce the stories. One of my favorite Thanksgiving “A Ha!” moments was discovering how to keep the mashed potatoes warm. After you finish making them, put them in the top pan of a double boiler, or even better, in a large, wide shallow stainless steel (heatproof) mixing bowl. Cover with foil or a lid and hold over gently simmering water for up to 2 hours! You’ll need to check the water every once in a while, but there are a couple of great things about this tip. First, the people who have a thing about being served less than piping-hot food (you know who you are, Dad) will be very happy. Secondly, you, as the cook, will not have to worry about making the mashed potatoes (along with everything else) at the last minute. 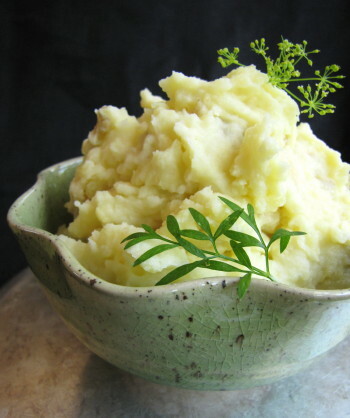 Of course, there are a few other tips to making good mashed potatoes. Probably the most important is not to over-mash. If you overwork potatoes (especially Russets), the starch will turn to glue. Usually, a stand mixer on high speed is the culprit here, so I always mash my potatoes with a hand-held masher. (We don’t mind ours a little rough; I also prefer to use Yukon Golds.) But a food mill will give you the most beautiful potato puree. I hope everyone has a wonderful Thanksgiving holiday, and if you need help with your menu, I’d recommend checking out Fine Cooking’s Thanksgiving Menu planner, which not only has a ton of great recipes, but will generate a shopping list and time line for you after you select the recipes for your menu. Of course the Baking Gratins chapter in Fast, Fresh & Green has some delicious ideas, too. And if you’re looking for quick vegetable side dishes, remember to tune in to The Martha Stewart Show on the Hallmark Channel on Wednesday, November 24 at 10 a.m. to see me roasting squash, turnips, and Brussels sprouts! The roasted garlic in this recipe makes these potatoes irresistible, but you can use the proportions here to make perfectly delicious mashed potatoes without the garlic if you like. This recipe yields a lot – enough to serve 10 people at Thanksgiving. (I originally developed this for a holiday issue of Edible Vineyard magazine.) But you can easily cut it in half to serve it some other time. In a Dutch oven or other large, wide cooking pot, combine the potatoes, 1 tablespoon kosher salt, and enough cold water to cover the potatoes by about 2 inches. Bring the water to a boil, reduce to a simmer, and cook until the potatoes are tender, a total of about 25 to 30 minutes. 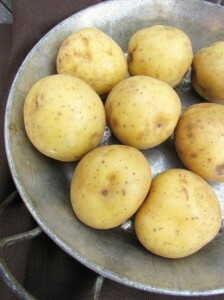 Drain the potatoes in a colander and return them to the cooking pot over very low heat. Toss the potatoes around for a few seconds to allow some of the excess moisture to steam off a bit. Add all of the butter, the garlic cloves, 1 teaspoon kosher salt, and 3/4 cup of the heavy cream. Using a hand masher and moving around the pot in a clockwise manner, mash the potatoes until they are coarsely mashed. Continue adding cream and mashing until the potatoes are mostly smooth. They will have a creamy texture with just a slight chunkiness and yummy bits of skin and garlic throughout. Towards the end of mashing, switch to using a heatproof silicone spatula to smooth the potatoes out a bit. Serve hot right away or keep warm over simmering water (covered) for up to 2 hours. 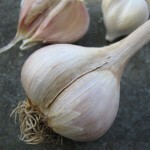 To Roast Garlic: Heat the oven to 350 degrees. 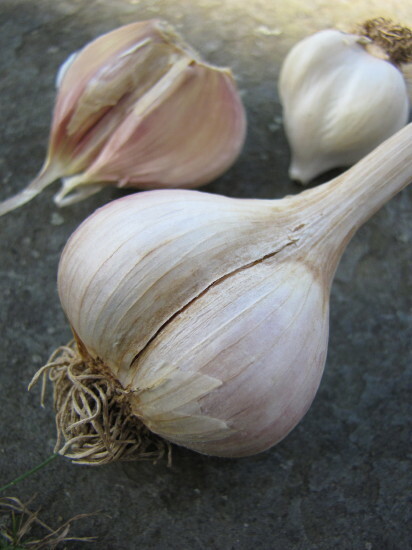 Take a very sharp chef’s knife and chop off about the top 3/4-inch of a head of garlic. (Or chop off enough so that each clove is slightly exposed). Leave the head in tact (do not separate the cloves) and place it on a double layer of aluminum foil. Drizzle the head (or the two heads, as in the case of the recipe above) with olive oil and wrap the aluminum foil up around the head. Place the package in a small casserole dish or on a small sheet pan and put it in the oven. Roast for 45 minutes or until the cloves are just tender and soft through. Let cool at least 15 to 20 minutes before squeezing the garlic cloves out of their skins by applying pressure to the base of the head. I just wanted to say that I love your cookbook. Every single recipe I have made has been amazing! I am just starting my first job and vegetables are so much cheaper than meat. Your cookbook brings excitement and flavor to my food. I am definitely looking forward to your new book. Thanks for the tater tips, Susie! Have a great Thanksgiving and good luck on the MS show on Wed. We’ll be watching! Happy Thanksgiving Susie! My dinner the other night was delcious — I love the root vegetable recipe and so easy. Looking forward to seeing you in action on MS on Wednesday. Hoping that Rod will also tune in! Taking your mashed potatoe recipe to Lewes for Thanksgiving — must run in the family that everything has to be piping hot! Hey Suzi, so glad the dinner was good. We’re just getting in the car to head to New York–will think of you and please wish Rodney a Happy Thanksgiving (and hot mashed potatoes), too! What a great tip! I’m always in charge of mashed potatoes, which means I’m usually in the way of my mom as she tries to finish the turkey! !